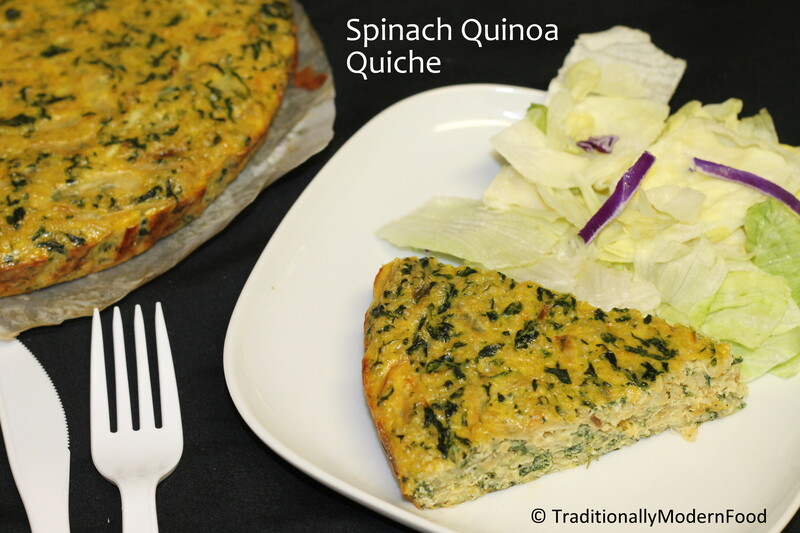 Spinach Quiche is crust-less quiche prepared with savory custard,quinoa spinach and cheese. Loaded with egg and quinoa, this a great protein rich meal. This Quiche goes well during any meal. Food network channel got me acquainted to Quiche. Most of the quiche version I saw had a pie crust. I dont have a pie pan and didn’t want to invest on that, so I didn’t try Quiche for a longtime. This year for Easter I saw lot of egg based recipes, one Kale Quinoa Crust-less Quiche recipe in food52 pulled my attention. It’s a Crust-less Quiche so I need not buy a pie pan. With lots of eggs I am sure this will attract my husband. Quinoa additions was one more thing that pulled my attention. I recently started experimenting with quinoa and this one was a interesting way to have quinoa. I had all the ingredients except Kale at home, when I was thinking about alternatives for kale, some other green in my fridge pulled my attention. I tried spinach quiche in my cake pan. After my Omelette Muffin, I tried a recipe with lots of eggs so I was little concerned with the taste but it turned out yum. I was not familiar whether it’s breakfast/Lunch/dinner food, since it was filling meal we had it for lunch. Its a great protein rich food for the toddler too. Beautiful recipe. I love that this is crustless. I like to make crustless pies and quiches every once in a while to put the spotlight on the filling. Great photos as well. I love that recipe. Your quiche looks wonderful, it turned out perfectly. Looks delicious very nice, glad you did it, can you link it to linkytool. What can I use instead of eggs. I want to try this quiche but eggless. Rachana, I haven’t tried Eggless Quiche version. I am sorry I couldn’t give you alternate option. While reading about Quiche I saw a version with tofu (without eggs). Try googling tofu Quiche without eegg, I believe thr should be a way. healthy and yummy Recipe.Nice texure. Looks so enticing & loved your recipe . quichee looks so good, but I don’t eat eggs. Otherwise I dont mind trying this recipe…. Looks inviting. I love that yellow n green combo of the outcome . looks super tempting!! At the first look I thought it was pizza!! 🙂 Perfectly made!! Wow Vidhya, this looks so soft, love the idea of adding quinoa. I should try this one day. For now let me just drool looking at it. Love crustless quiche which is always on the menu. 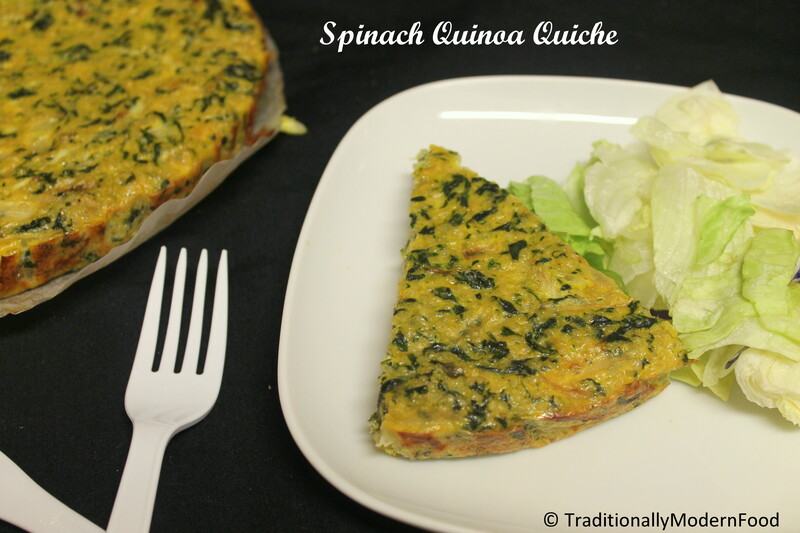 This spinach quiche looks super healthy! This looks so perfect dear. Love the recipe! 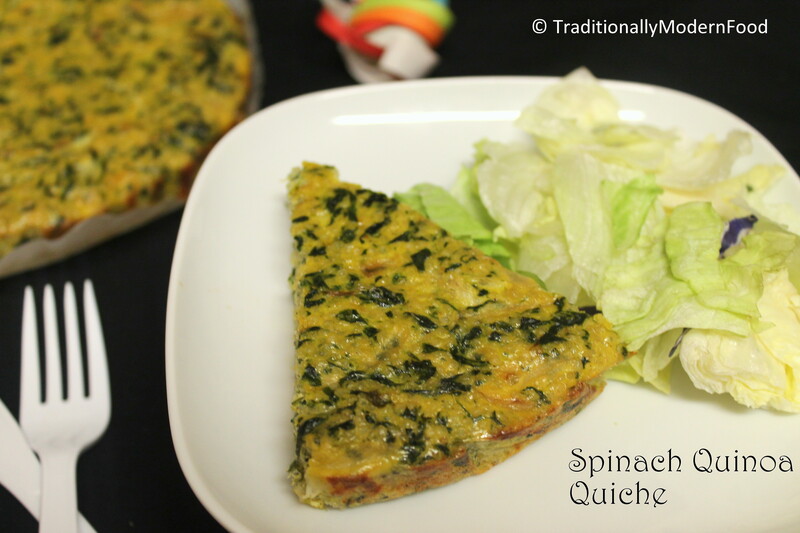 Spinach Quiche looks so healthy and delish. Love this is crustless. Addition of quinoa sounds intriguing. I must try this crustless,healthy quiche,looks so perfect….